Enter text to search the available studies. Allows you to quickly filter the studies displayed in the Algo Explorer pane. All Available Studies: Displays all available studies. This is the default selection. My Favorite Studies: Displays all studies that you have marked as a favorite. The list of technical indicators that has been applied to the chart. 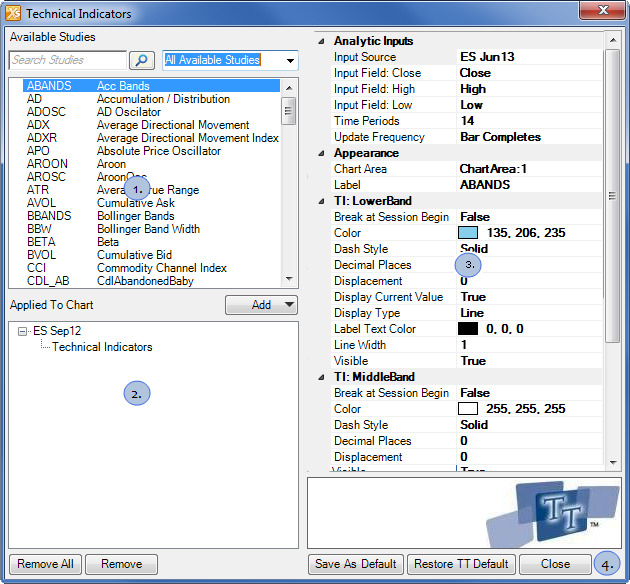 Click the technical indicator name to display the associated properties. Removes the selected technical indicators from the chart. Removes all technical indicators from the chart. Contains the properties that control the how the technical indicators displays on the chart. These properties will vary depending on the technical indicators selected. To change a property type in the new value or use the drop-down button to select a new value. Refer to the List of Technical Indicators for a complete list of available technical indicators and their significant properties.